Nearly 90 percent of the time, a diagnosis of non-melanoma skin cancer lesions are the result of someone spending too much time in the sun without using some kind of protection against UV rays. Additionally, the damage that exposure to excessive ultraviolet radiation can do to the skin, along with tanning beds, is also the cause of most signs of premature aging —fine lines, wrinkles, dryness, age spots and loss of elasticity. In fact, a group affiliated with the World Health Organization called the IARC (International Agency for the Research on Cancer) lists tanning beds as one of the most carcinogenic substances on the planet, along with UV radiation, cigarettes and plutonium. 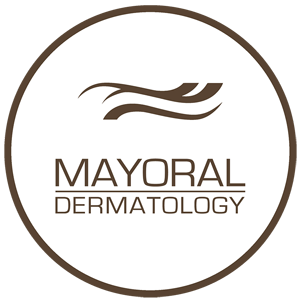 At Mayoral Dermatology, we urge all patients to recognize the warning signs of skin cancer and have any suspicious moles, lesions or other skin anomalies immediately examined by one of our physicians. Growths that have an irregular border and is larger than ¼ of an inch in diameter. Early detection of skin cancer is the most important factor in determining the success rate of eliminating carcinogenic cell growth and preventing the most serious form of skin cancer from developing—melanoma. Extensive damage to the skin cells’ DNA caused by the intense UV radiation emitted by the sun or tanning beds may trigger mutations within the DNA that abnormal proliferation of skin cells. Emerging from the rapid multiplication of cells are malignant tumors indicative of melanoma. Originating in the cells that produce melanin, melanoma usually look like moles and often develop from an already existing mole. Most cancerous moles are blackish-brown but some may be purple, pink or white. When detected in its early stages, melanoma is treatable and 90 percent of the time curable. It is only after the cancer remains unnoticed for some time and spreads throughout the body (especially into the lymph system) that it becomes difficult to contain. Although melanoma represents a less commonly seen type of skin cancer, it is the type that is responsible for the most deaths. 1. Superficial melanoma— most commonly seen among individuals diagnosed with skin cancer, superficial spreading melanoma remains on the skin’s top layer for a long time until it intensifies enough to begin penetrating into the skin’s deeper layers. Typical signs of superficial melanoma include patches that are raised slightly and exhibit ragged, asymmetrical borders. Colors of these patches vary from brown or black to bluish-white. Generally, superficial melanoma starts as a benign mole and changes its appearance slowly. Patches tend to appear on the upper back, chest and legs but can arise anywhere on the body. 2. Acral lentiginous melanoma—although this type of melanoma also spreads superficially, it penetrates the skin more deeply in its advanced stages. However, the location of an AL melanoma is usually found on the bottom of the feet, the palms or as a brownish-black discoloration underneath the finger or toenails. More Asians and African-Americans are diagnosed with AL melanoma than Caucasians. 3. Nodular melanoma—as the most aggressive form of melanoma, nodular melanoma is recognized as a bump that is black, brown, red or tan. Primarily seen on the arms, legs, trunk and scalp of elderly people, nodular melanoma represents about 10 percent of all skin cancers and often remains undetected because of its light pigmentation. It does not spread like other melanomas but embeds itself deep into the skin, which is another reason why recognizing this type of skin cancer is difficult. People at risk for developing nodular melanoma include those with an unusual number of moles, a family history of nodular melanoma, being over 60 years of age and years of overexposure to UV radiation. Actinic Keratosis—also referred to as “solar” keratosis, this growth appears crusty or scaly and is often found on the face, lips, bald scalps, shoulders, ears and hands. Just about anyplace on the body that has experienced long-term exposure to ultraviolet radiation is vulnerable to actinic keratosis lesions. Developing slowly at first and often disappearing and reappearing in stages, AK may itch, feel tender and exhibit an inflamed shade of red. As the lesion progresses, it may start feeling wart-like, rough or gritty. An AK lesion is usually more difficult to see than feel. Although the presence of AK does not mean you have skin cancer, it should be taken seriously because it has the potential to develop into full-blown melanoma. Squamous cell carcinoma—abbreviated as SCC, this is the second most commonly diagnosed form of skin cancer and arises from abnormally accelerated cell growth within the epidermis’ squamous cells. Composed primarily of squamous cells, the epidermis is the skin’s topmost layer and receives the brunt of damaging UV radiation. Patches of SCC are readily visible and will appear red, scaly and elevated, with a distinct depression central to a warty growth. Sometimes an SCC lesion may be an open sore that bleeds and crusts over without ever healing properly. 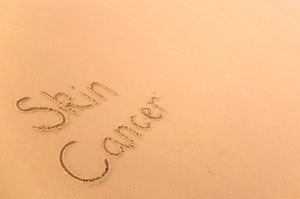 Skin affected by squamous cell carcinomas generally exhibit the classic signs of overexposure to UV radiation—premature aging, wrinkling, dryness and discoloration. However, SCC has been seen in all areas of the body, including mucous membranes, so no area is immune to this precancerous disease. When diagnosis of an atypical mole is made following a biopsy, further biopsies may be ordered if the mole is later suspected of harboring cancerous cells. People who have many atypical moles need to perform a regular self-examination of these moles to detect changes early enough for the implementation of successful treatment methods. For removal of actinic keratosis areas we use cryotherapy, a procedure involving freezing the skin’s surface with liquid nitrogen. Due to changing the molecular structure of the skin, it will then peel, blister and eventually slough off, initiating a beneficial healing process that allows new, noncancerous skin cells to emerge. Cryotherapy may be used to treat other abnormal moles and lesions as well. Chemical peels provide results similar to cryotherapy and are implemented by applying chemicals to lesions for the purpose of sloughing off diseased skin to be replaced with new skin. The solutions used to treat precancerous growths is much stronger than those used for wrinkle reduction or scar removal and produces deep peeling in order to completely eliminate abnormal cells. Photodynamic therapy is especially effective on facial lesions and skin cancers located on the scalp. We apply a photosensitizing agent called topical 5-ALA and a local anesthetic to the lesion prior to targeting the area with intense light beams that activate the 5-ALA. This destroys precancerous growths like actinic keratosis but does minimal damage to healthy skin surrounding the affected area. Especially effective for precancerous lesions affecting the scalp and face is laser surgery treatment. By using an erbium or carbon dioxide YAG laser to excise unwanted tissue without any bleeding, Mayoral Dermatology specialists can eliminate unsightly growths that may contain potentially contain carcinogenic cells. Laser surgery is also used on patients taking blood thinners since it does not encourage blood loss and on people who have tried other lesion removal treatments that did not successfully inhibit the reappearance of additional lesions. Many clients coming to Mayoral Dermatology for the removal of squamous and basal cell carcinoma will most likely undergo Mohs surgery. Considered one of the most effective techniques for the eradication of skin carcinomas, Mohs surgery allows a doctor to remove only the skin that is affected by cancer cells. Performed under local anesthesia, patients feel minimal discomfort as the doctor gently excises individual layers of skin off the lesion. These layers are then examined under a microscope in order to detect cell abnormality. The procedure is completed when the doctor no longer detects any cancer cells in the most recently removed layer of skin. Patients who have not been diagnosed with metastasized skin cancer will experience excellent results with the many state-of-the-art dermatological procedures we offer at Mayoral Dermatology. If you have a skin condition that is worrying you, call us so we can begin providing you with a full range of services to quickly and accurately diagnose your condition and start implementing a treatment program especially designed for you.